The First Design Award Project we submitted in the Hospitality/Public Space Category is the Ronald McDonald Wylie House. Interior Surface has had the pleasure to work on 2 separate projects for RMH, and we hold this project very near to our hearts as we were able to help provide 200 more families places to stay while utilizing services at Children’s Mercy Hospital. Can the interior design of a commercial space feel like a hug to the soul? That is exactly what the newest Ronald McDonald Design Team faced when planning The Wylie House, in Kansas City. The goal of the design was to make families feel welcome immediately upon entering the home. Providing 20 additional families with a place to call home was a great feeling for this talented and dedicated project team. Weathered wood flooring, soft lighting, and a neutral color pallet accentuated with pops of color throughout the area, bring in excitement and fun. Balancing residential and commercial design was critical to maintain the warmth of a home, while providing the durability needed for a high traffic commercial space. To make the home feel less commercial, carpet runners were selected to highlight the ornamental staircase. LVT, porcelain, and laminate were selected for the main areas to provide durability and ease of maintenance. Speckled rubber tile, in the color of seaglass, was used to balance aesthetics with function in the play area. The majority of the children that come to the Wylie House are siblings to those in the hospital. With no outdoor space to play, the designers wanted to bring the essence of outdoors inside. This was accomplished by using a green needlepunch carpet tile to simulate grass. 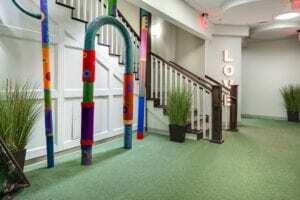 To remain environmentally friendly, a fun rainbow inspired carpet constructed of 100% post production 6.6 nylon was used along with reclaimed wood and barn doors salvaged from the original building. 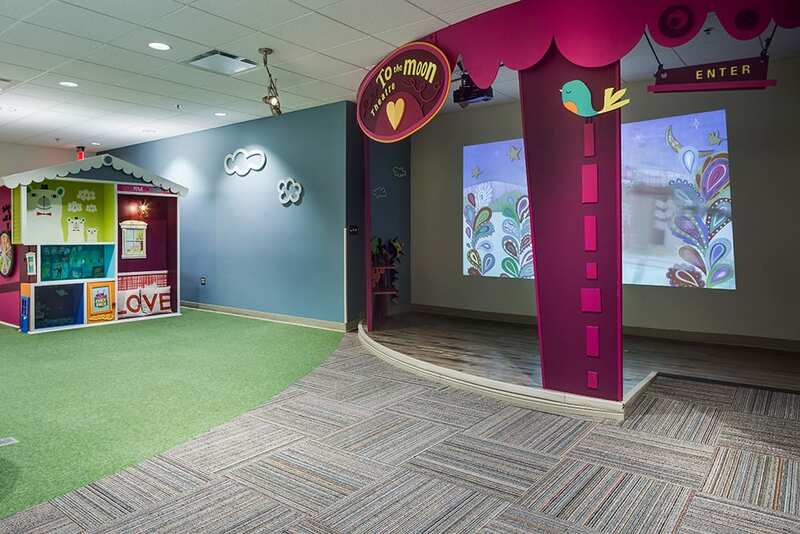 The finishing touches include an interactive play installation bringing a fun and adventurous Willy Wonka feel to the play area while providing families with a warm and inviting refuge from their medical adventure.